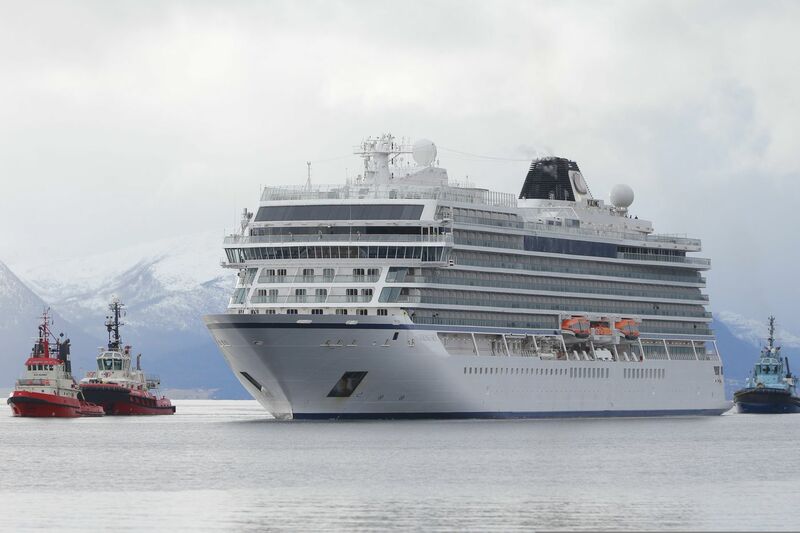 The cruise ship Viking Sky arrives at port off Molde, Norway, on Sunday after encountering problems in heavy seas off Norway's western coast. COPENHAGEN, Denmark (AP) — Norwegian officials have opened an investigation into why a cruise ship carrying more than 1,370 people set sail along the country’s often wild western coast despite storm warnings, forcing a major evacuation by helicopter. After about half of the ship's passengers were taken off, the captain made the decision mid-day Sunday to halt the evacuation. About 900 people were still on board when the ship limped into the port city of Molde on its own engines. Viking Ocean Cruises said Monday it had begun "an internal investigation .... to establish a complete and thorough understanding of what happened," and welcome the official investigations which they "will fully support." In the same statement, Viking Ocean Cruises chairman Torstein Hagen also said he "would like to personally apologize for what our guests experienced." Liseth said investigators were heading to Molde on Monday and declined to speculate why the Viking Sky captain had decided to sail to Stavanger in the first place despite the weather warning. He couldn't immediately say how long the cruise ship would remain in Molde. Yngve Skovly, of the police force in Moere and Romsdal district, where Molde sits, said there is no suspicion of a criminal offense but police have opened an investigation to find out why the ship had engine problems. That probe would be part of the one by the Accident Investigations Board. Viking Sky’s next trip, to Scandinavia and Germany, which was to leave on Wednesday, has been canceled but its owner said no other trip cancellations for the ship were foreseen yet.